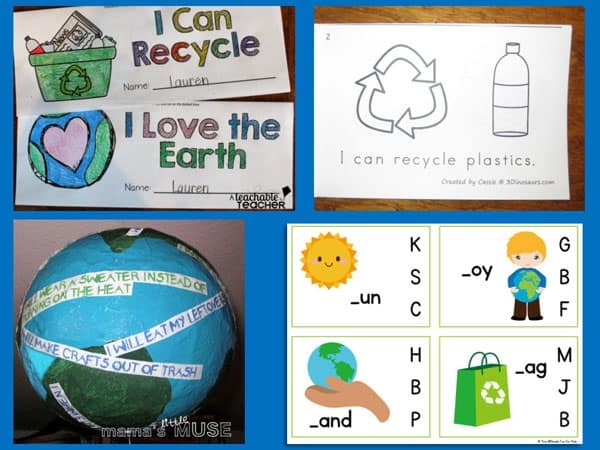 These Earth Day literacy activities integrate important science and citizenship lessons with letter learning, sight word practice, writing letters, and word work such as ABC order. My kids have always been naturally interested in Earth Day. The idea behind it is easy for them to relate to and understand. We spend a lot of time teaching children to keep their toys, books, and selves clean. So, of course, it makes sense to them that we should also keep our planet clean. Last year we enjoyed making an Earth Day craft with recycled plastic. It was fun and looked beautiful. More importantly, it gave us the opportunity to talk about taking care of the environment. This year, we’ll be bumping the educational side up a notch. 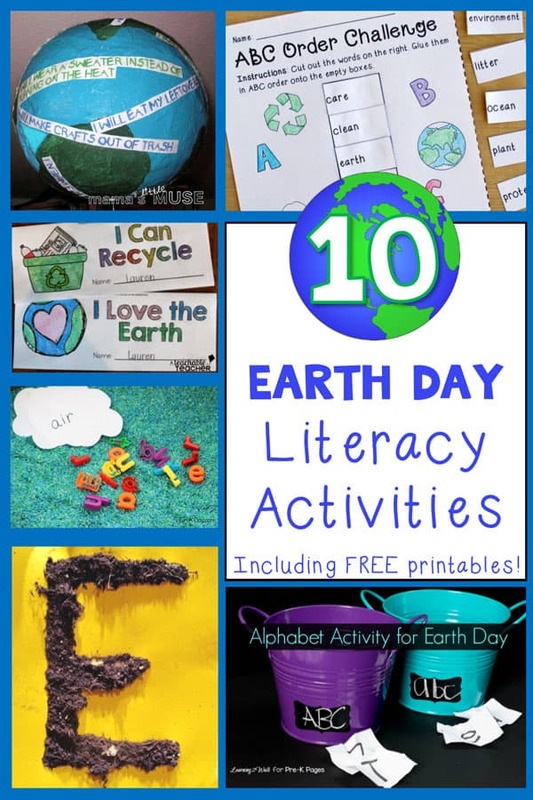 I made a free printable Earth Day themed ABC order activity (see below), and have put together a list of other fun and free Earth Day literacy activities for you here. 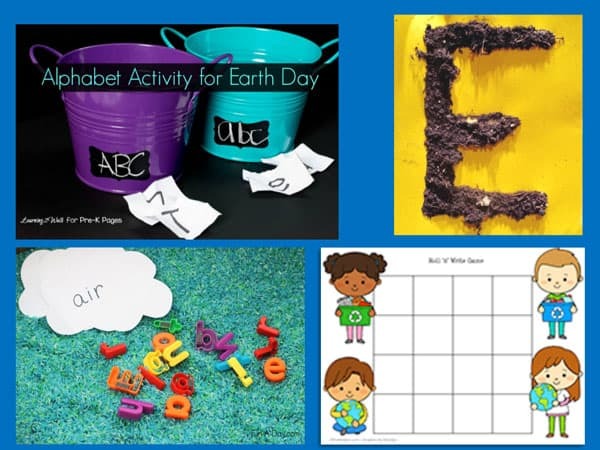 You can encourage letter identification and distinguishing uppercase and lowercase letters with this Earth Day alphabet activity shared on PreK Pages. For kids who relish getting their hands dirty, this Letter E activity from Carrots are Orange is perfect for engaging young preschoolers in a little letter recognition. Be sure to read all the details and tips before you “dig” in. Fun-a-Day explains a fantastic Earth Day themed sensory bin that encourages word building. 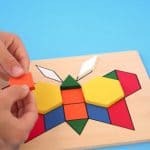 This could be used with advanced preschoolers or with kindergartners. Who wouldn’t love to dig their hands into it! 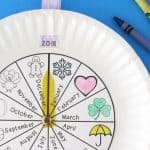 The free printable Earth Day roll ‘n write game on Prekinders is an engaging way for preschoolers to practice writing their letters. Simple Fun for Kids has a cute set of free Earth Day beginning sounds clip cards. 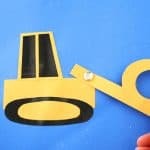 Just right for hands-on phonics practice! A Teachable Teacher offers free Earth Day fold and snip books that encourage writing. They can be differentiated for a wide range of levels. 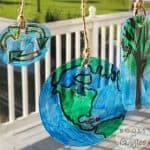 I love the creative Earth Day pledge activity that Carolyn at Mama’s Little Muse came up with. If you’re a classroom teacher, you could easily adapt it to a poster or bulletin board display. 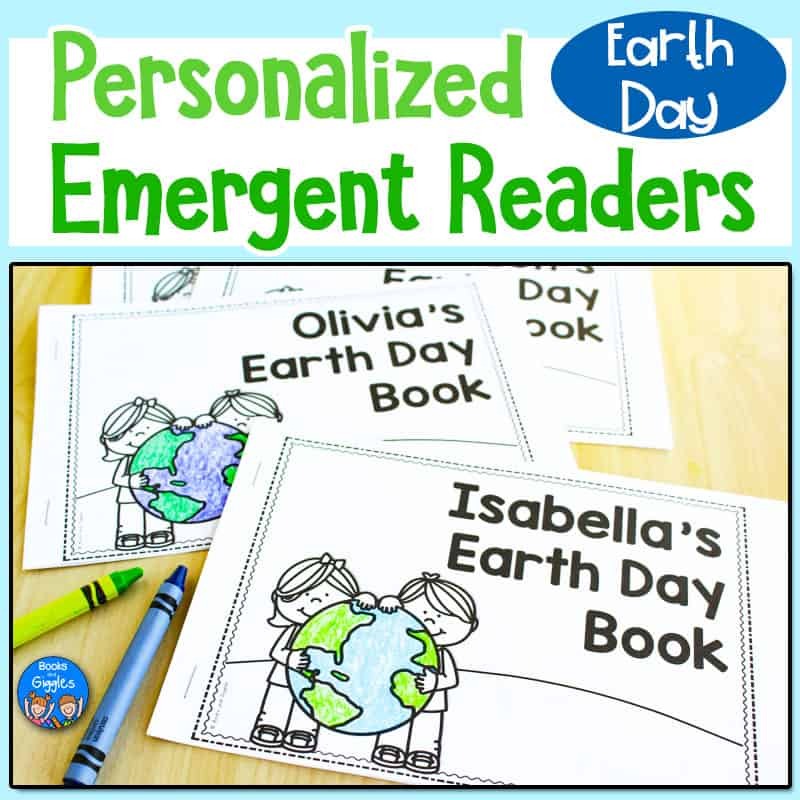 I’m updating this post to add these personalize-able Earth Day emergent readers which are now in my store. You can type in your students’ names on one page, and then they magically appear on every page of these little books. The simple Earth Day Easy Reader book from 3 Dinosaurs provides practice reading basic sight words, plus exposure to words like recycle and planet. Get kids reading and giggling with these clever and funny Earth Day jokes for kids from A Mom with a Lesson Plan. 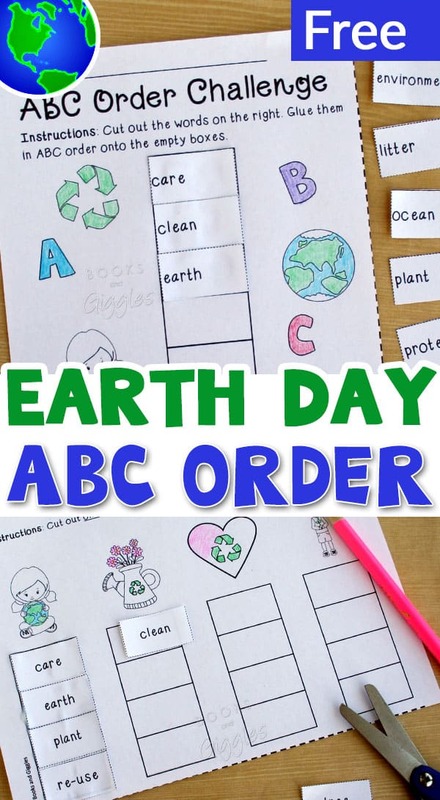 Last, but I hope not least, I have an Earth Day ABC Order activity for you! I’ve uploaded it to my Teachers Pay Teachers store, where you can download it for free. 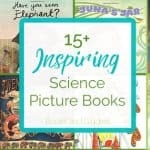 Pingback: Inspiring Earth Day Reading List for Children - Crafty Mama in ME!